“Like Yesterday” – Out now!!! 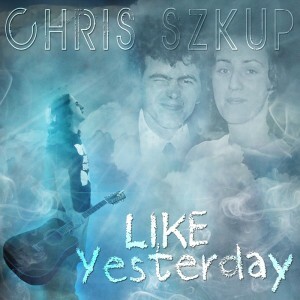 “Like Yesterday” is the new single and it’s out now!! This one is also the last in the acoustic run of singles. It remembers and says thanks to my parents and talks about what life was like when they were here. To me, music, and especially rock music is about baring your soul….. after all, whats the point of listening to someones music if it isn’t honest? With this song, I don’t think you could get a more personal song or a song that I believe in more. I get goosebumps looking at the artwork that Dan created from my concept idea. It really is beautiful. Strangely, the concept for it came from the photo of me with the guitar which existed before the concept, although it looks like I knew exactly what I was doing and was posing accordingly. As usual, Dan was able to take my Tasmanian gobbledy gook and knock it out of the park with another amazing piece of work. I remember showing my Dad the music for this song before any lyrics existed as I had just gotten strings from the amazing Lyris Hung on a couple of my songs (having real strings in my music was always a dream when I was younger, but one that I was never really sure if it would happen), which in retrospect was a real special thing having him hear the music for this one. Obviously the song wasn’t intended to be what it is back then, but I’ll never forget that night. That was one of my favourite things in the world – just hanging over a couple of beers, playing music for each other and catching up. Will miss it a lot. In loving memory of my folks, Bysh and Irene Szkup. Much thanks to Dennis Leeflang (mixing), Lyris Hung (strings), Andy VanDette (mastering), Dan Verkys (artwork) and Ren Reich (engineering) on this one especially. It’s available in the STORE here at CS-Songs.com, as well as iTunes and all the usual digital outlets that stock our stuff!